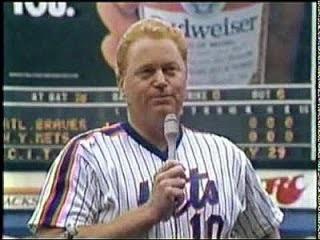 Sunday, July 13th 1986: Rusty Staub Day: The Mets took this chance to honor "Le Grande Orange" Rusty Staub inducting him in the Mets Hall of Fame. Rusty Satub came out from center field riding & waving to the fans in an orange convertible. Bob Murphy was the opening MC for the on field ceremonies, donning a pink jacket & blue pinstripe shirt with blue tie. Rusty's Satub 's family was on hand including his mother, two sisters & brother. Ralph Kiner also helped out with the on field ceremonies, where Rusty was honored for his playing days, his restaurant business & charity work with the NYPD. 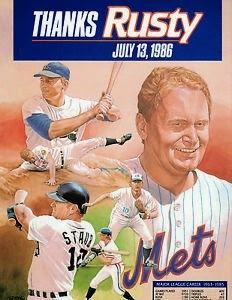 Mets GM Frank Cashen then gave Rusty Staub a check for $25,000 for the Rusty Staub Foundation. Even the Archbishop of New York, Cardinal John O'Connor was on hand to make a speech & a few jokes referencing the Pope on Rusty's behalf. The highlight of the event was when Keith Hernandez came out honoring Staub with a plaque from his former Mets team mates. 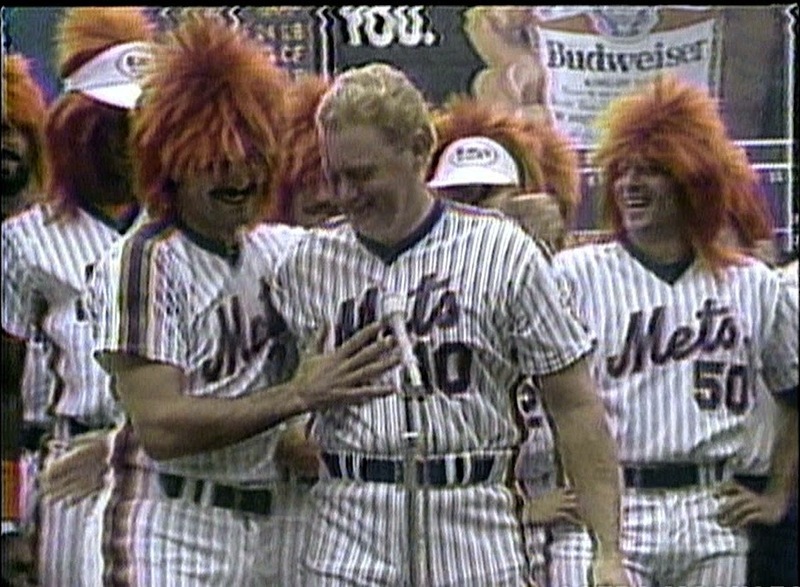 Hernandez called for the team & the 1986 Mets came out of the dug out donning long red wigs to congratulate Rusty on his day. Some of the players including Darryl Strawberry, Howard Johnson & Wall Backman also padded their bellies in honor of Rusty's growing waist size. After the ceremonies, Davey Johnson's first place Mets (59-25) took on Chuck Tanner's fifth place Atlanta Braves (42-46). Ron Darling (8-2) went up against veteran Doyle Alexander (6-4). Alexander only surrendered four hits in the game, the first was a 1st inning triple to Lenny Dykstra, who would score on Wally Backman's ground out. Dykstra returned in the 6th inning with a solo HR giving the Mets all the runs they would need for the win. Ron Darling went the distance, shutting out the Braves scattering none hits & striking out seven. Darling did not walk anybody on his way to his ninth win of the year. He closed out the day with a 2.84 ERA as well.